Beyond the well-known ancient constellations in the sky, there are many unusual modern constellations that are often overlooked. The modern constellations are an unusual bunch — here's a tour of the highlights. Ever wonder about what folks used to do for entertainment hundreds or even thousands of years ago? Back then, there was no light pollution and anyone who wanted to could look up at the sky on any clear night and see a sky spangled with stars. In much the same way as a child of today might play the game "connect the dots," ancient people would look at the sky, tell stories, use their imagination and connect the stars, forming them into patterns we call constellations. And all around the sky were regions where only faint or dim stars prevailed. So, in more recent times people have invented new constellations to fill some of these spaces. We called them "modern" constellations to differentiate from the older star pictures that were conceived before the 15th century. In our early summer evening sky now are two examples of modern constellations. They are both situated between the bowl of the Big Dipper and the bright yellow-white star Capella, in Auriga, the Charioteer. The first is Camelopardalis, which in Latin means giraffe. The giraffe was a somewhat exotic creature to 17th century Europeans; its species name refers to its camel-like shape and its leopard-like colors, hence "camel-leopard." The constellation is composed of many faint stars and to imagine them forming a giraffe is, indeed, a masterpiece of imagination. The constellation was invented by a Flemish astronomer, Petrus Plancius (1552-1622) in the early 17th century. The giraffe constellation would probably have been long-forgotten, but for Johannes Hevelius (1611-1687), a 17th-century astronomer, artist, engraver, and a leading citizen of Danzig, Poland, who was the first to christen the giraffe as Camelopardalis specifically. Hevelius claimed that he saw the constellation's many faint stars as the spots of a giraffe. The other is the Lynx, one of only two animal constellations that has identical Latin and English names (the other is Phoenix). This celestial feline is rather dim and hard to visualize. It was Hevelius himself who placed this one in the sky. And from examining the old astronomy charts and star atlases, which represented the constellations as allegorical drawings, the brightest star of Lynx was in the tuft of its tail. And from these drawings it would seem that a sort of celestial catfight is about to be provoked — as nearby Leo Minor, the Smaller Lion, seemingly is about to bite Lynx's tail! I know of some people who refuse to use iPhones, and one person I know still uses a rotary phone. Hevelius was seemingly cut from the same cloth. Although the "new-fangled invention" of the telescope was coming into general use during Hevelius' time, he refused to use it and wasn't timid about letting others know his feelings about the new device. In his star atlas of 1690, he actually tucked a cartoon into the corner of one sky chart showing a cherub holding a card with the Latin verse "The naked eye is best." And, indeed, a Lynx is a cat-like animal that possesses excellent eyesight. The constellation Lynx itself is a region mainly devoid of bright stars, and Hevelius openly admitted that you would have to have a lynx's eyes to see it. This from the same guy who claimed to see spots on the nearby giraffe! Nicolas-Louis de Lacaille (1713-1762) is considered a pioneer in astronomy. Between 1751 and 1753, this modest but hardworking French astronomer was stationed at the Cape of Good Hope in South Africa where he catalogued the positions of 9,766 southern stars in just 11 months. He was one of the early explorers who filled the gaps of the southern sky with 14 new constellations, all composed mostly of very faint stars, which formed patterns that could be considered dim and pointless. Interestingly, while the ancient constellations honor men and women of mythology, as well as animals and beasts of yore, Lacaille chose to honor inanimate objects. Lacaille's constellations included an Air Pump (Antlia Pneumatica), Sculptor's Chisels (Caela Sculptoris), The Compasses (Circinus), a Chemical Furnace (Fornax Chemica), a Pendulum Clock (Horologium), a Carpenter's Square (Norma), Hadley's Octant (Octans Hadleianus), a Painter's Easel (Equuleus Pictoris), a Mariner's Compass (Pyxis Nautica), a Rhomboidal Net (Reticulum Rhomboidalis), a Sculptor's Workshop (Apparatus Sculptoris), a Microscope (Microscopium), a Telescope (Telescopium) and, finally, Table Mountain (Mons Mensae), which overlooked Lacaille's observatory. Some constellations simply didn't make the cut. A German astronomer, Johannes Elert Bode (1747-1826), published a star atlas in 1801 (Uranographia) that contained several of these defunct star pictures. Among these were Officina Typographica, the Print Shop or Printing Press, which honored the invention of movable type by another German, Johannes Gutenberg. Bode also introduced Machina Electrica, an early form of electrical generator whose spinning disk picked up a static charge that could be stored in a Leyden jar or other condenser. And finally, there was Globus Aerostaticus, created in 1798 by French astronomer Joseph Jerome Le Francais de Lalande (1732-1807) to honor the hot air balloon. Lalande's most famous non-creation was an animal: Felis, the Cat, just above Lacaille's Pump. He explained his choice: "I am very fond of cats. I will let this figure scratch on the chart. The starry sky has worried me quite enough in my life, so that now I can have my joke with it." Sometimes I wonder if Pat Sullivan and Otto Messmer, early 20th century cartoon creators of the anthropomorphic cat with black body, white eyes and giant grin named "Felix," got the idea for the name from Lalande's Felis? I remember as a youngster reading an article in MAD magazine (probably dating back to the 1950s), which asked the question: What would the constellations look like today if they reflected the styles and concepts of our modern society? I don't have the article anymore — I wish I did — but it demonstrated, in the style of allegorical sky pictures, how Ursa Major (the Great Bear) could be converted into "Ursa Smokey" (complete with his ranger cap; another "Great" Bear). And how Orion, the Hunter could also be considered as "Mantle, the Slugger." 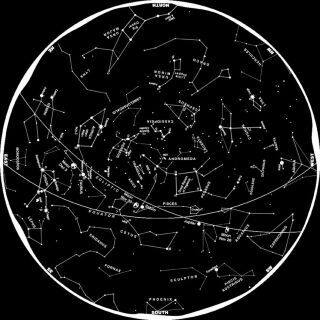 George Lovi (1939-1993), who wrote the "Ramblings" column for Sky & Telescope magazine for over two decades, created a few of his own whimsical constellations that he shared with his readers. To complement the star pattern popularly known as The Teapot, Lovi turned the nearby constellation of Ophiuchus into a tall coffee pot. He also demonstrated how, by using the constellation of Auriga, Orion could be shown flying a kite. But the best Lovi invention was his merging of the constellations of Lepus and Colomba into a fire hydrant, which he called "Hydrantus." Not entirely by coincidence, Canis Major (The Big Dog) stood immediately adjacent to Hydrantus! Finally, about 35 years ago, a syndicated planetarium show took a satirical swipe at those meaningless and shapeless constellations from the 18th century. The show was called "The Universe Game" and was created by the staff of the Strasenburgh Planetarium in Rochester, N.Y. During the show, the narrator pointed out the constellation of "The Larch." The Larch was "a constellation made of stars too small to be seen with the unaided eye," the narrator said. "Keen observers may also see a cow upside-down in the tree." And at that moment, a picture was projected onto the sky dome of a large spreading tree with an upside-down cow at the very top. Those in the audience with the keenest eyesight might also have glimpsed an image of Abe Lincoln's face in the tree trunk, as was the fashion in the pop art of the early '80s. I'm sure Hevelius, Lalande and Lacaille would have loved it!